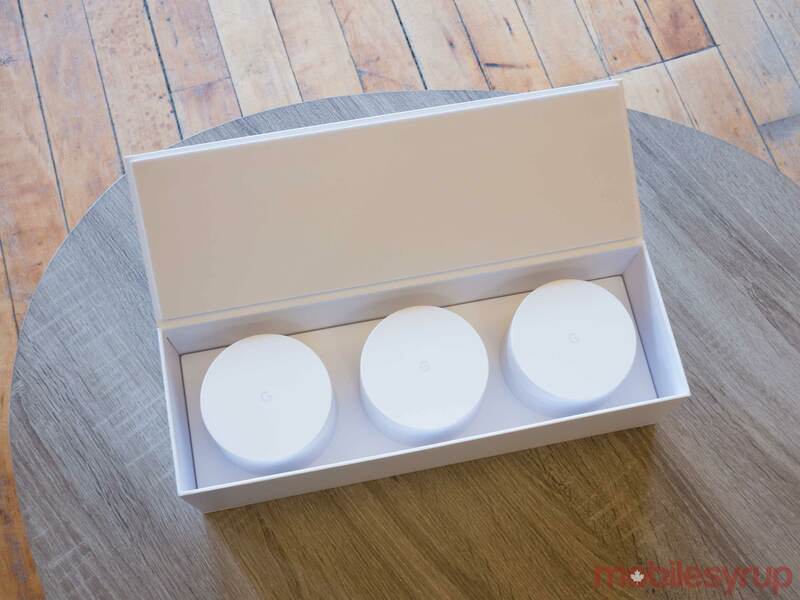 Nearly seven months after debuting in the United States, Google has now brought its Google Wifi expandable mesh network system to Canada. The tech giant joins a relatively small pool of mesh offerings currently available — primarily Linksys’ Velop system, Netgear’s Orbi, Securifi’s Almond 3 and Amped Wireless’ Ally — and it does so at the competitive price of $439 CAD for a three-pack and $179 for one individual router. Since it hit the shelves today, April 28th, at the Google Store, Best Buy Canada, Staples Canada and Walmart Canada, I took the system for a test drive to see if it was a drastic improvement over my own single router, the Rogers-provided Hitron CGN3ACSMR. So what is a mesh network and why is it better than a single router? If you’ve ever encountered dead zones within your home where the Wi-Fi connection is weak and perhaps even non-existent due to the construction of your home, interference or sheer range, then you’ve hit on the reason behind wireless mesh networks. A wireless mesh network uses multiple wireless routers — or as Google calls them, ‘points’ — to provide better coverage over a certain area of space. The routers communicate with each other, thus providing more seamless hand-offs than a wireless repeater may be capable of, and enlarging the size and stability of Wi-Fi access in your home. Google first began developing its interest in Wi-Fi hardware approximately four years ago, according to the company. 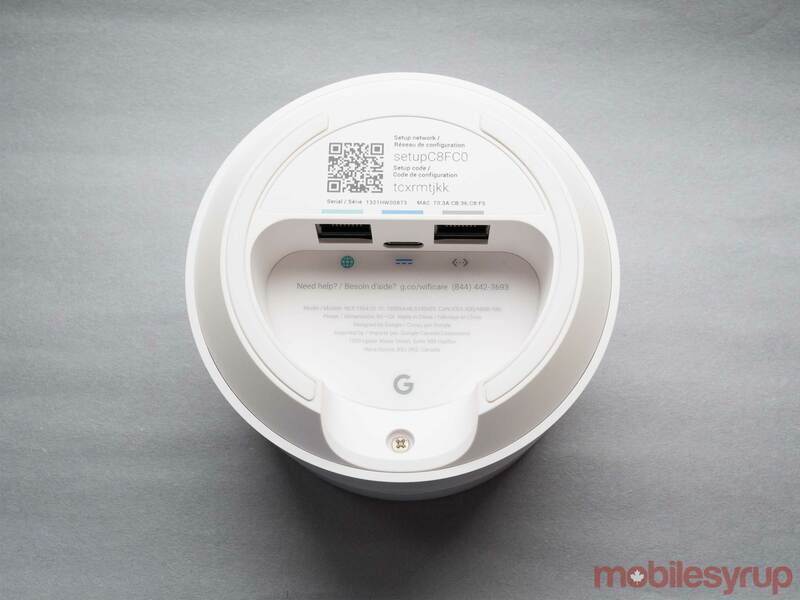 It eventually came out with the OnHub router (co-developed with TP-Link) in August 2015. The router came along with an app that promised users the ability to carry out troubleshooting and administrative changes using an app — rather than the more common, and confusing, web interface. 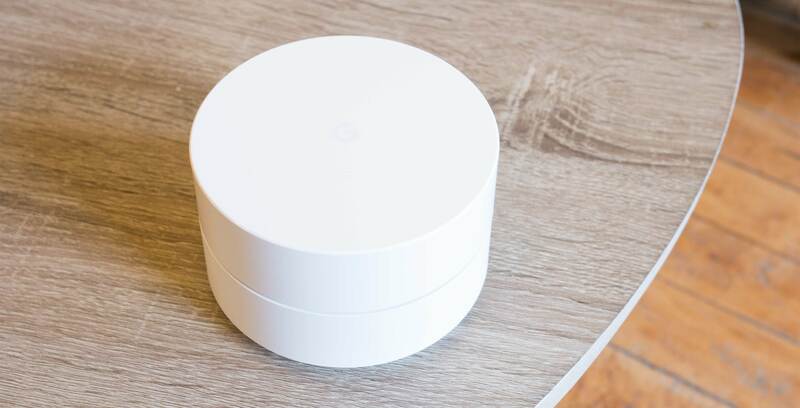 Google Wifi, which can be used together with OnHub, is the next evolution of the Mountain View company’s router aspirations. Visually, it has a beautiful, minimal all-white aesthetic that would look very much at home in an Apple Store. It’s round with a flat top and the width of an average grapefruit. Everything about the device is matte white, apart from a very subtle ‘G’ on top and a cutout around the middle that emits blue light. On the back is an in-line reset button. There’s a distinctly futuristic vibe about the whole thing. I feel as if a robot voice may emit from it at any moment — though Google Home and Wifi product lead Ben Brown refrained from commenting on whether the company’s AI speaker Google Home might eventually be packaged together with the system at a recent press briefing in Toronto. At that same briefing, Brown said that the stylish appearance of Google Wifi was in fact a key design element for functionality. After all, typical routers usually aren’t something that people like to display. They have big antennas, bulky cords and designs that don’t take interior decor in to account. As a result, they are often confined to closets or secluded areas of the home where guests won’t see them. They’re Boo Radleys. Unfortunately, tucking your router away also reduces its signal strength. 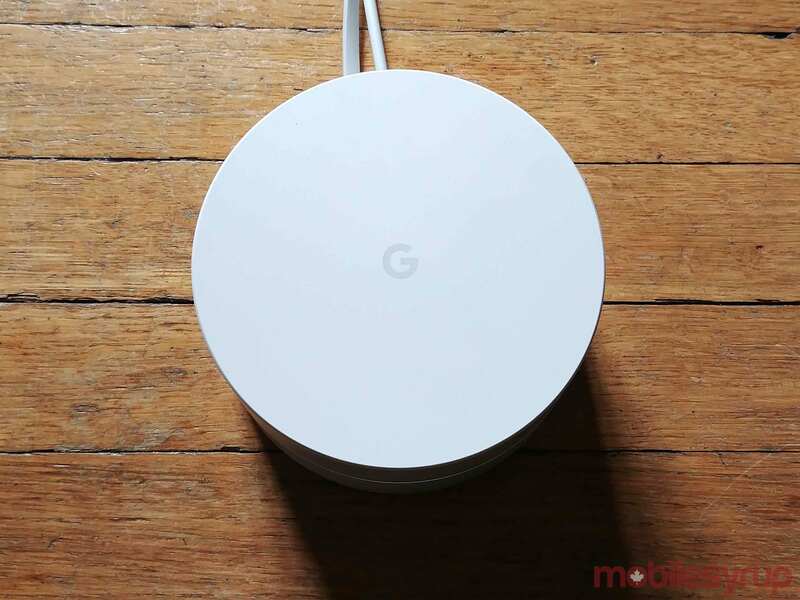 “The fact that it was ugly and had to be hidden was a design issue,” said Brown, noting that the Google Wifi points are designed to be attractive enough to place in plain view on a side table or shelf, for instance. In that regard, Google Wifi succeeds. I find the points actually add to the aesthetic appeal of my home. Though I will note that the system didn’t completely solve the issue of displaying my less beautiful Hitron router, since it must be connected to Google Wifi by an ethernet cord for the system to work, and there is no handy place in my living room to hide it. Another aspect of the traditional router experience that Google aims to solve with its Wifi mesh network is the user interface with which you control it. 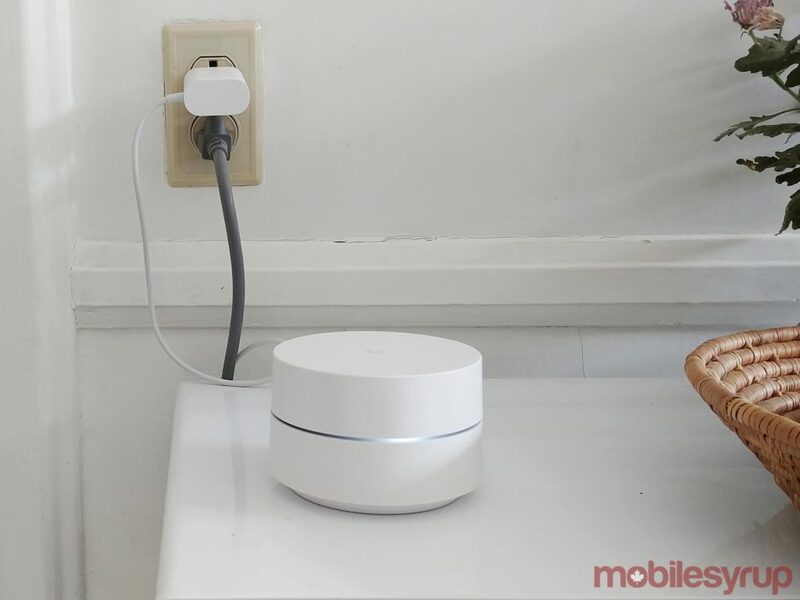 Instead of going to your router’s daunting web control interface, you just download an app — Google Wifi — that first helps you through setup and then provides a robust set of functionalities for ruling over your own Wi-Fi kingdom. One of my favourite features of the app is the setting that lets you easily prioritize certain devices to receive more bandwidth. You can also easily see and share passwords and create a guest network while still allowing friends to access specific devices like a Chromecast. Those who have kids will likely enjoy the fact that they can pause Wi-Fi access for their childrens’ devices (or schedule pauses) and those with less tech-inclined parents or seniors in their lives can become a remote network manager for another home’s mesh system through the app. 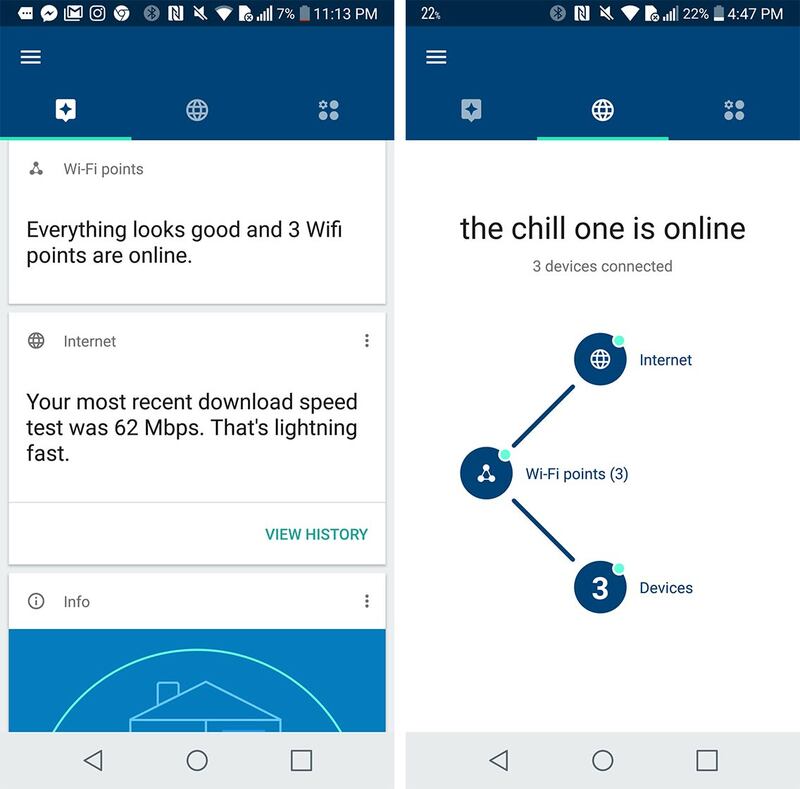 Additionally, you can see what devices are connected, remotely check the health of your own network and run speed tests. All this, in an extremely simple-to-use app that looks a bit like a network-specific version of Google Now. At the press briefing, Brown brought up the fact that “a good bulk of [the] team was based out of Canada and still is,” and that they contribute primarily to the mobile app and on-device software — which means Canadians are to thank for its ease of use. Yet another key selling point for Google Wifi — it’s easier to setup than other routers. In theory, this is true. In practice, I ran into some trouble with the super simple one-page card of instructions. On every Google Wifi point (all of which are identical) there are two Gigabit ethernet ports and a USB-C port. What I didn’t know, and what the instructions didn’t state explicitly, is that only one port on each point is able to function as a WAN port and so I first plugged the ethernet cord from my Hitron router into a LAN-only port. After a period of confusion, it was pointed out to me that a visual on the card showed a green globe by the WAN port which matched up with an indicator on the device itself. Stupid mistake, sure. But I also think it’s an indication you can go too far when it comes to minimal instruction pages. In any case, once that issue was resolved, setting up the other points took only a matter of minutes. All my roommate and I needed to do was plug them in and pair them with the app. As a side note on security — Brown states that during the setup process an encrypted connection is made between the phone, the app and the device in order to secure data, and each point has a trusted platform module (TPM) — a dedicated microcontroller designed to secure hardware by integrating cryptographic keys into devices. Additionally, in case you were wondering whether Google is standing by its motto of “Don’t be evil” and respecting your privacy, the company published a post that states: “the Google Wifi app and your Wifi points do not track the websites you visit or collect the content of any traffic on your network,” though it does collect data such as Wi-Fi channel, signal strength, and device types. Users can manage the three types of data collected — cloud services, Wifi point stats, and app stats — in the app. Once I had all the points setup and named by room, I got to work speed testing in order to compare the results with my pre-Google Wifi tests. For reference, my household runs on a Rogers Ignite 60 internet plan — a plan that is no longer on the market, replaced by Rogers Ignite 75. It promises speeds of up to 60Mbps download and 10Mbps upload. While those speeds (and higher) have been accurate where the router sits, in the front part of my very long apartment, service has been terrible in my bedroom about five rooms down. Can’t-even-watch-Netflix-terrible. In the living room, where the router has always been, Google Wifi didn’t provide a hugely significant improvement to speeds. The average download speed I was receiving before setting up Google Wifi (tested through Speedtest by Ookla, Netflix’s Fast.com and Rogers’ own tool) was 67.74Mbps, the average upload speed 10.97Mbps and the average latency 12ms. After setting up Google Wifi, I saw an average of 70.40Mbps down, 10.89Mbps up and 13.5ms latency. Then, curious to see if there would be a tangible difference in performance, I tested once again after I turned off wireless for the Hitron router. The result was a slight increase of 70.67Mbps down, 11Mbps up and 13.5ms latency. More important to my overall enjoyment of my home’s Wi-Fi network, however, was the reception in my own bedroom, separated by a long corridor and five rooms’ worth of thick walls. In that respect, the difference is extreme, and significantly improves my quality of digital life. After setting up the point in my bedroom, I experienced a robust 71.47Mbps down, 11.07Mbps up and 14.5ms latency. Without the point, I receive 32.09Mbps down, 10.83Mbps up and 16.5ms latency. Google Wifi provides these speeds through AC1200 2×2 Wave 2 Wi-Fi technology with simultaneous dual bands (2.4GHz/5GHz) supporting IEEE 802.11a/b/g/n/ac. It should be noted that its specs and slightly meager port offerings per device certainly aren’t the best on the market. In contrast, the Netgear Orbi two-pack (which retails for about $549.80) is tri-band (2.4GHz/5GHz) and has four gigabit ethernet ports on each router. The Linksys Velop three-pack (about $550) is also tri-band and has two WAN/LAN auto-sensing gigabit ethernet ports per device. Of the other Canadian wireless mesh competitors available in Canada, neither boast tri-band technology. The Amped Wireless Ally-0091K (about $429.44) has a USB port, modem port and three gigabit LAN ports on the main router and one gigabit port on the ‘extender,’ while the Securifi Almond 3 comes in at about $499.99 and has one WAN gigabit port, two LAN gigabit ports and one USB 2.0 port per device. But when it comes down to it, Google Wifi isn’t really about the specs. It’s about design and simplicity of use. And with its easy-to-navigate and extremely functional app and gorgeous design, the device has nailed that value proposition.